Before I begin, I absolutely must thank all of you who supported me throughout the season at So You Think You’re Crafty. Even though I didn’t come out on top, it was a thoroughly enjoyable experience, and one that truly ignited my creativity! I want to congratulate Melissa on an incredible season. Her projects were all top-notch, and she is such a nice person, too! 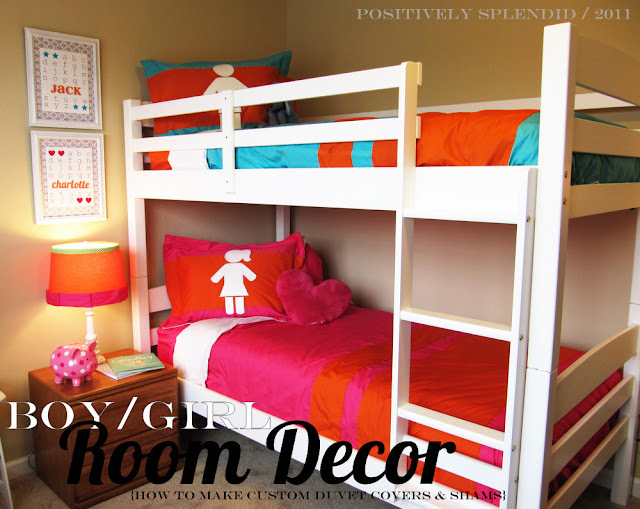 This coordinating boy/girl room decor was my contribution for the final act of SYTYC, and today I’m going to share with you how I put the duvet covers together – for just $10 each! Ready to see what I did? I’m so excited to share! Having just moved into a new home, I wanted my final project for the competition to be something fun that reflects my overall crafting personality, but also something practical for our new place. We recently purchased a bunk bed for my older kiddos’ shared room, so I opted to use this challenge as my impetus to get their bedding and decor squared away. I set to work creating coordinating pillow shams and duvet covers, as well as repurposing an old lamp to match and putting together personalized alphabet samplers to adorn the walls. Shared boy/girl spaces can be a challenge. 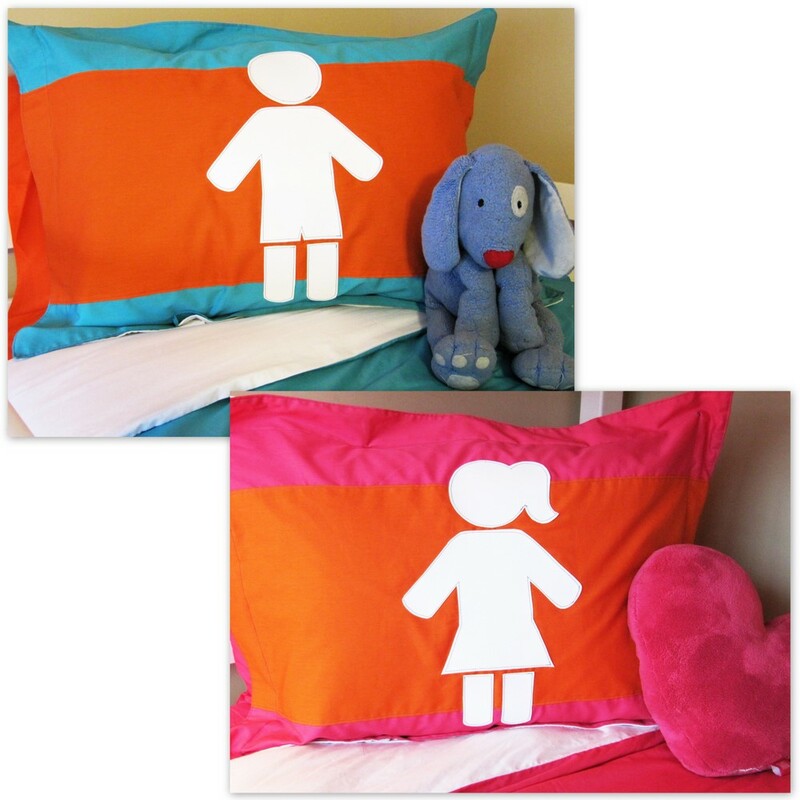 I wanted the bedding to coordinate, but I also wanted it to be as suitable for a boy as it was for a girl. Enter my little vinyl applique boy and girl symbols on the shams, which leave no question as to just who exactly occupies this space! I opted for turquoise and hot pink as the main colors for each of the bedding sets, tying it all together with a series of orange stripes. Whether you’re in the market for matching bedding as I was, or if you’re just wanting to create bedding for a single room in your home, I think you’ll find the tutorial for how I made the duvet covers particularly simple and easy to do! *Note: I purchased my sheets from Walmart for just $4 apiece. You’ll need to do a couple of additional calculations, as well. Now, cut out your pieces. From the sheet that will be the front panel piece of your duvet cover, cut 1 piece that is X by Y. Note: Cut these back panel pieces from the top and bottom edges of your sheet so that one of the Y (width) sides of each falls on a hemmed edge of your sheet. 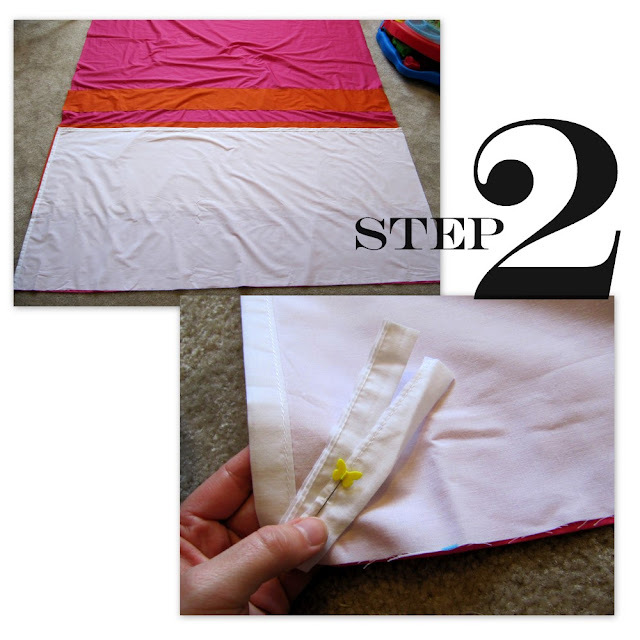 This will save you from having to hem things later on – a huge time-saver! Very good! Now let’s get sewing! step 1 / Press the long edges of your stripe pieces under 1/4″, leaving the short sides unpressed. Pin your 18″ stripe 12″ up from one of the short edges of your front panel piece. Edgestitch along the long edges of your strip to secure it to your front panel. 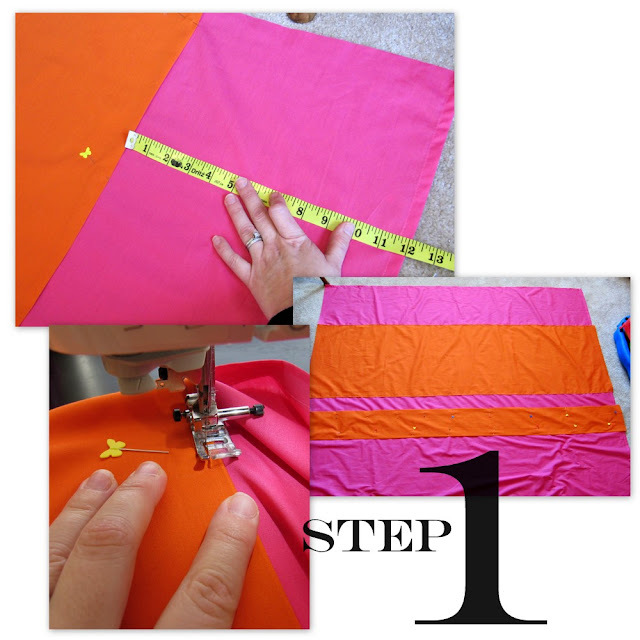 Pin your 6″ stripe 3 inches away from your first stripe, and stitch in the same manner. step 3 / Pin your longer back panel piece in the same manner, making sure the hemmed edge of this piece overlaps the hemmed edge of the piece you pinned in step 2. Pin folded pieces of ribbon or fabric to these corners, as well. 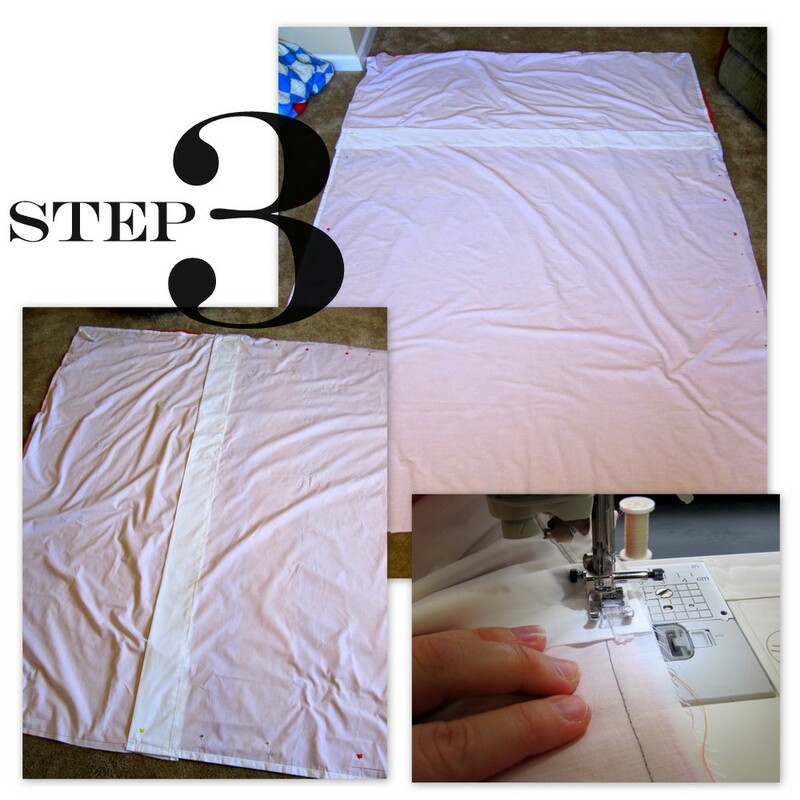 Using a 1/2″ seam allowance, stitch all layers together. If desired, serge or zig-zag your seams to finish. Clip your corners, turn your cover right side out, and use a turning tool (or a wooden chopstick) to help you push your seams and corners out thoroughly. Press. Now, set snaps (or apply buttons) on the overlapping flaps of your cover so that it remains closed when in use. I recommend at least 5-6 buttons or snaps to ensure there isn’t any gapping. Your duvet cover is done! Great job, I am a newby sewer and just finished a queen duvet cover for my step daughters room. It was very tedious working with so much material, but was a ton of fun! Will watch for your sham tutorial! These are great… another thing I have done in doing this project is bought one of those cheap heavy blankets at Walmart for about $4 and put them on the inside to give the cover a little weight.. but I live in Maine so it is necessary! i am definitely planning on making these for my boys, thanks for the tutorial! These turned out so cute! 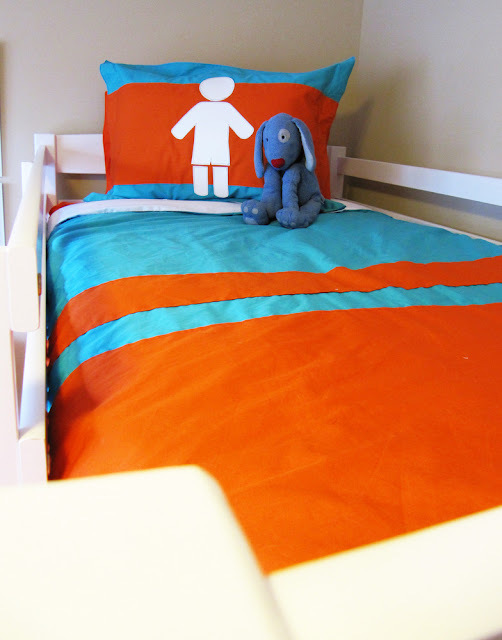 This may just be my solution to finding matching bedding for my boys! Thansk for the great tutorial Amy! Wow! The bedding is great. I love how bright and colorful it is. SUCH an awesome way to incorporate both sexes into one space!!! I love this project! Also love the simple white bunkbed–Can you tell me where you got the bunk beds? Ditto what Karin said. Where did you get the bunk bed -it’s just what we’ve been searching for? I love the bedding and hope to give it a try.